A kiss, a sigh and Microplaza is over. A mini album so short that it can escape one's attention without ever noticing the album at all. Soft, sweet, Rivella, all at the same time. Microplaza is Bonny 'Prince' Billy, Donovan, alternative pop, Neil Young, a host of U.S. Americana acts and a lot more all in one go. With one main difference: a song doesn't last a second longer than strictly necessary. One minute and a little, that is all Microplaza allows itself to tell the story. In one way that is a pity, as it keeps me wondering what the songs could have been, on the other hand it is not, as all seems to have been said and played. 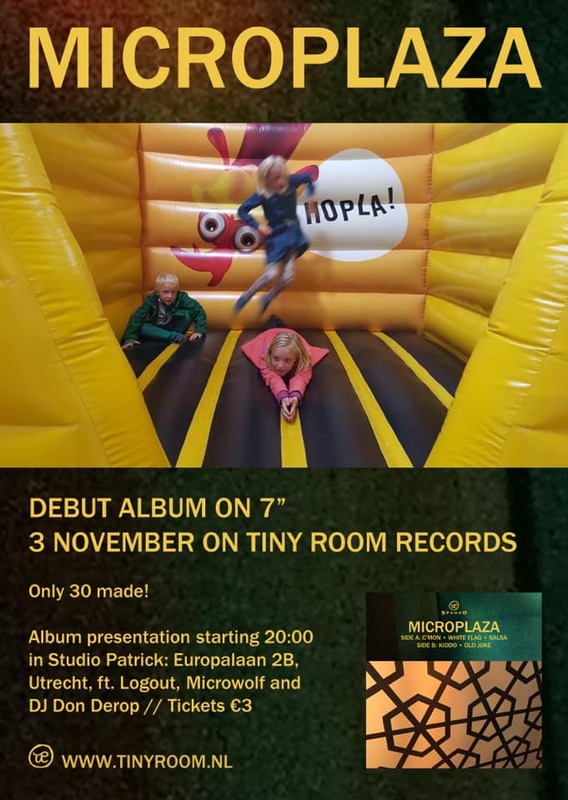 Microplaza is multi instrumentalist Arno Breuer and singer Benjamin van Vliet. Breuer plays in several bands, all tied to Tiny Room Records. So does Van Vliet, bar the final comment. Breuer had five finished tracks but doesn't like to sing. Having ran into Van Vliet on musical occasions he sent the music to him with the request to sing; whatever he liked to the music. He added his lyrics and vocals and some solo guitar. The result is released as a 7" single on Tiny Room Records. In a way Microplaza is as fragmentary as Moon Moon Moon can be, with the difference that Microplaza remains fragmentary and allows for a little controlled madness even more. Just listen to the weird (children's) voices popping up in several of the songs. It gives the album an otherworldliness that makes it kind of attractive as well. What is really going on here?, is a valid question the listener can ask himself. Without necessarily answers being provided by Microplaza. Let alone by me. Eight minutes is not a lot to make a point. Some bands need more for a single composition. Microplaza makes 5 in the same time. In my opinion 4 out of 5 succeed. The final song 'Old Joke' is not my favourite, the others are to the point and succeed. Listen to the children's voices in 'Kiddo', they only barely fit the music, yet are so right. All the tiny music holds a few surprises, an instrument that pops up and plays a nice snippet of a melody or as added percussion. There are only 30 copies of Microplaza printed, so if you want one, be fast. See the link below.